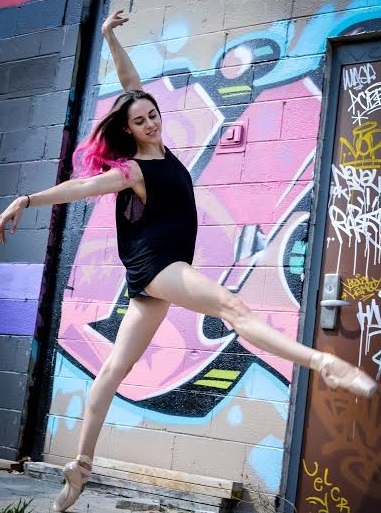 Ellie Bernstein was born and raised in NJ, where at age 15, began dancing professionally with a ballet company. At 16 she was accepted into the prestigious Indiana University Jacobs School of Music and at 17 moved to Bloomington, Indiana. Over the course of her 4 years at IU, Ellie had the privilege of working closely with esteemed dancers and choreographers such as Violette Verdy, John Clifford, Julie Kent, and Susan Jaffe. During her final year at IU, Ellie made the difficult decision to retire from the world of ballet and continue life as a “normal” person. She met and married the love of her life and they decided to remain in Bloomington to set up their lives. After hating grad school and the new career she had chosen, Ellie decided to return to the world of physical movement by obtaining her 600 hour comprehensive Pilates certification. Soon after, she found yoga and the rest was history. Reflecting back on her dancing days, Ellie realized that it wasn’t performing or even really dancing that she was in love with, but rather the monotony of barre work at the beginning of class. From a young age it was the meditative movement and attention to detail and technique at the barre that Ellie has fallen in love with. No matter what was going on in life or in the world, that time at the barre was a time for escape from the chatter of the mind and sharp focus on somatic movement. The transition to yoga could not have been a more obvious and natural one for Ellie. 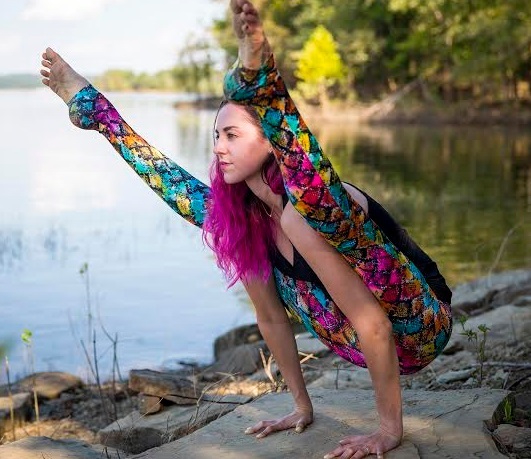 She has since earned her E-RYT 200, RYT 500 and is on staff at Vibe Yoga Studio in Bloomington, Indiana. She also works with a variety of brands and charities on Instagram, enjoys writing and blogging in her spare time, and is currently working on her first book. I think one of my best qualities is that I'm really good at encouraging people. I know what it feels like to feel like you can't do something and that is just about the worst feeling in the world so I try my hardest to always make people feel capable and to see the strength and fire they have within. Most of the time it's not that folks cannot do something, it's that they think they can't. By helping them shift their perspective and put their heart and soul into the possibility of "yes, actually I can! ", amazing things can happen! This is a tough one. I'm not sure anyone really can be the best? Except for Stevie Nicks. Seriously, though, as a former ballet dancer I have this competitive edge within myself that I'm always trying to shed, so thinking about what makes me the best is extremely challenging. To be honest, I often feel like I'm not good enough. This is something I've carried with me since my dancing days and am working really hard on changing. All I can do is try my best and then I know that that is enough. Whether it's "the best" or not doesn't really matter, and I'm starting to be OK with that. I'd love to write a book. It's something that has been in the back of my mind for a while and I feel like 2016 is my year to at least get cracking on it. I also think it would be great fun to teach at a yoga festival one day! A girl's gotta have some dreams! Yoga has made me a better human being. I don't really count successes as things I've done or stuff I've accumulated, but rather how I've changed for the better. Yoga has this funny way of revealing all parts of yourself to yourself, like a big giant mirror. Oftentimes you don't want to see every part. You want to continue hiding from your shadows or pretending they don't exist. Unfortunately (or rather, fortunately) yoga's like NOPE. Here you are. Here is ALL of you. And you begin to deal with your demons--your dark side. You start to realize more about yourself and more about who you want to be, and what is holding you back. Yoga allows you to peel back the layers and labels that have been thrust upon you so that you can return back to yourself, to become a more compassionate, kind, and loving human being. So, to better answer this question, I think my biggest success is allowing yoga into my life--like really allowing all parts of yoga to permeate my being. There have been plenty of challenging moments in my life, but the most recent was in the summer of 2014 when my cat Sylvie almost died of kidney failure. Thankfully my husband and I were able to bring her to Purdue University where they worked wonders of magic and science on her, with cutting edge surgery and she survived. The aftercare was a nightmare and I was terrified I was going to screw something up. I know to some it may seem ridiculous because she is a cat, but she's my child. I couldn't love her anymore if she were human. There is so much love for her in my heart, it's indescribable. To be completely responsible for everything that was happening to her was so hard on me and I was extremely nervous to mess something up, which might have meant life or death. In the end, she's doing just fine, and a year and a half later she is bouncing around like a brand new kitten, like nothing ever happened. When you get the news that something is wrong with your baby, it's like a knife through your heart and you feel so helpless. Utilizing the focus and strength I've found via my yoga practice to take care of her during that rough time was the greatest gift. "If it's not fun, why do it?" It's from a Ben+Jerry's bumper sticker. I get that not everything in life is fun, but you can make just about anything a bit more light and joyful by shifting your thinking and seeking out the positive side. Stevie Nicks, always and forever. In the world of yoga there are many, but the two that stand out the most for me are Faith Hunter and Marsha Pappas. I've been extremely lucky and blessed with work with both of these women who truly exemplify what it means to be a teacher. Oh gosh, I could go on forever. But the two questions I get asked the most are about mascara and face products so I'll let you in on those secrets! Yves Saint Laurent Babydoll Mascara and I use Jurlique products for my skin! Yoga, writing, being a wife and cat mom, fitness, animals with disabilities, pizza, coffee, and finding great new shows to watch obsessively on Netflix.